TVXQ’s Max Changmin has changed. The latest filming of KBS 2TV’s ‘Our Neighborhood’s Master of Variety and Sports’ had the celebrity team bowling against the Incheon Dongchun-dong Hearoes. On this day, Max Changmin, the black hole of the team, showcased a different side of himself that no one had ever seen before. The person playing against him is Baek Deok Hyun (61) the ace of the Dongchun-dong Heroes with a 100% strike rate that gave him the nickname “100%”. Although the Dongchun-dong team assumed it would be an easy win for them, they sat with mouths open wide in shock as Max Changmin surprised them all. 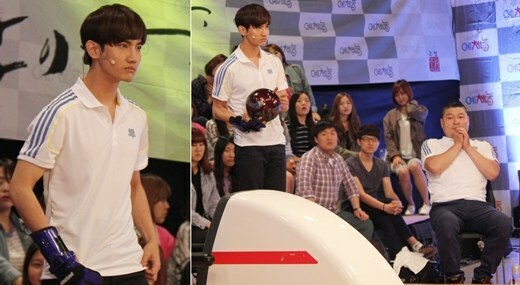 Max Changmin’s surprise uprising will be shown in the episode of ‘Our Neighborhood’s Master of Variety and Sports’ at airs at 11:20pm KST on the 11th.